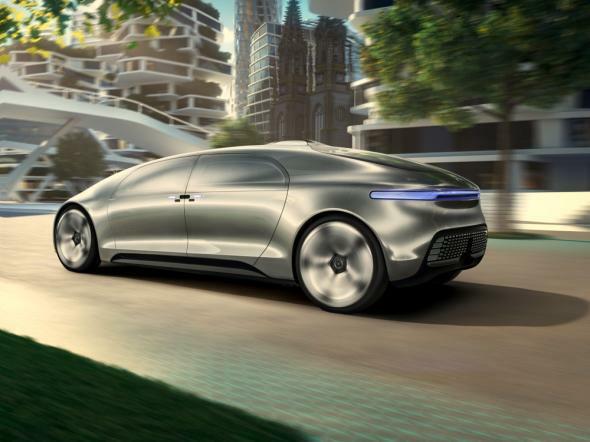 CES: Mercedes F015 Luxury in Motion self-driving concept car is wildly futuristic. Self-driving cars use lasers to map the environment around them as they go. In a gee-whiz unveiling worthy of a World’s Fair from the 1950s, Mercedes on Monday revealed a self-driving concept car that looks so futuristic that it’s hard to believe it’s real. With its elongated, podlike design and loungelike interior, it looks more like a computer-design project or a Hollywood prop than anything you’d actually drive. It is definitely real, however. I fought my way through a crowd of dazzled techies to get an up-close look at it after Mercedes unveiled it Monday night at the Consumer Electronics Show in Las Vegas. 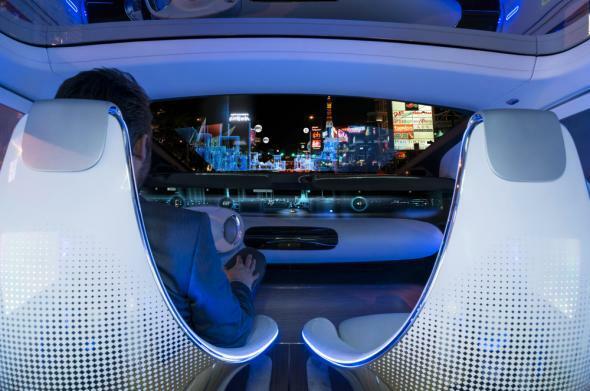 As industry analysts and bloggers swarmed around the vehicle, two Mercedes reps lounged on the swivel chairs inside, surrounded by softly glowing Internet-connected displays that can be controlled via eye tracking and hand gestures. To be clear, it isn’t there yet. Mercedes has tested some advanced self-driving technology in its S-Class sedan in the past, and similar state-of-the-art systems are apparently built into the F015. But Zetsche acknowledged that major obstacles remain before the company will put a fully autonomous vehicle on the road, including questions of safety, privacy, and legal liability. “We need to get from technically feasible to commercially viable,” he said. What’s really new here is the car’s design, which imagines what automobiles might look like in 15 years, when autonomous driving is widespread. Like the driverless-car prototype that Google unveiled last year, the Mercedes F015 radically reconfigures the interior to reflect the potential absence of a human driver. The car could incorporate a heads-up display that tracks and responds to the driver’s eye movements and gestures. The second big difference is that Google’s car does away with human controls altogether. Zetsche said Mercedes will never do that. “The user of a Mercedes-Benz will always remain the decision-maker,” he said, with the option to take control if she chooses. 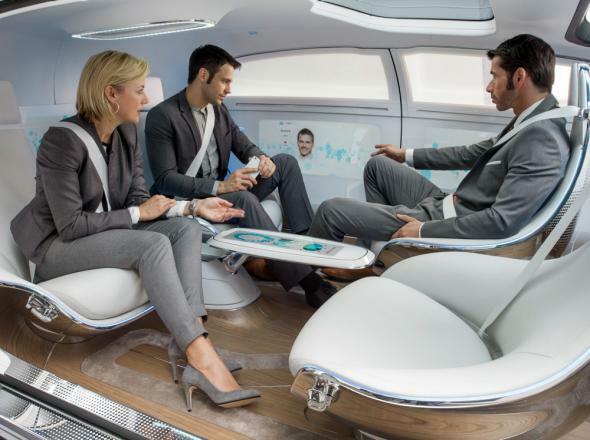 The F015 allows any one of the four passengers to take control of the car—or they can swivel their chairs and let the computers take over. So is this really what a Mercedes S-Class will look like in 2030? Probably not. It’s just a little too futuristic-looking to represent any actual future I can imagine. It looks, in fact, an awful lot like this 1957 ad for the electric, driverless cars of the future—a resemblance that Mercedes acknowledged in its press conference Monday. Think of this instead as a public act of scenario planning on Mercedes’ part. The company knows cars are changing, and it wants to be in the vanguard. The F015 represents one direction they might go. Regardless, the F015 was a show-stealer on Monday. People were so excited to go up and see it after the press conference that I was afraid there would be a stampede. And it’s notable that Mercedes chose to do it at CES, rather than at the Detroit Auto Show, which starts next week. After decades of iterative design changes and scant innovation, car companies are becoming tech companies once again.